Each one of us, has at one time or another, had to be at the center of certain decisions. Some of the decisions we made turned out well, others didn’t quite shape up the way we wanted them to. But, hey, who can blame us? After all, they were not simple decisions such as having two spoons of sugar or one in a coffee cup, They were very complex decisions. Decisions that would change the course of many individuals for the time to come. Ask a father who has to decide about a marriage proposal for his daughter. Is this man going to keep my daughter happy? Is he the right man? Or you may talk to a university going student, for whom choosing between one course and another is horrendous in itself. A leader, too, has his worries. If he decides to take a certain step, he directly affects the lives of a multitude of followers or members, if he hesitates, there’s no saying what might happen. Life is a series of decision making processes. At each step, we are called upon to exercise the finer judgements to steer certain matters in a preferred direction. Most of the times we make trivial decisions, but the moments that account for those mammoth resolutions, cannot be sidelined at any cost. At the end of the day, one has to decide, lest he falls in the trap of the Greek mythical donkey, whose only choice was to feed out of a bundle of hay or a pail of water, but not both, For many days, it could not decide which one was more important to it’s survival. After the lapsed time, the donkey died…not out of hunger and thirst, but due to inanition, Indecision, if you may. Any decision involves two R’s. Risk and Return. Sounds too financial? Believe it. This is true because all decision making involves the future. We can only make decisions about the future; no matter how much we may regret it, we cannot alter the past. Indeed, there is one thing certain about the future, which is that we cannot be sure what is going to happen! Sometimes, we have be able to predict with confidence that what actually occurs will be one of a limited range of possibilities. We may even feel able to ascribe statistical probabilities to possible outcomes of occurence, but we can never be completely certain of all the future. Risk is therefore an important factor in all decision-making and one that must be considered explicitly in all cases. In all aspects of life, risk and return tend to be related. Intuitively, we expect returns to relate to risk. In investment, for example, investors require a minimum rate to induce them to invest at all but they require an increased rate of return, the addition of a risk premium, to compensate them from taking risk. 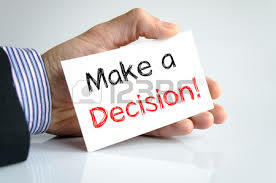 Life is toughest for the individual making the decision, although some people make it look like child’s play. For these, it is perhaps their resoluteness or their objectivity in thought that affords them the luxury of calm and composure, otherwise a lot of people simply lose their cool. For the on-looker,however, everything appears magnified, exaggerated. One fails to understand why X is taking so long to take a decision which, one evidently feels is so minute. These variations vary out of perception. The striker of a football team knows best why a ”golden chance” was in fact so difficult. To the commentator and other viewers, there couldn’t have been a better opportunity. As a community, our leaders are called upon variously to make certain very sensitive decisions. Decisions with which we are mostly not satisfied. Workers in various social circles as well are victims of this insensitive and incomprehensible attitude by fellow community members. And if the very circumstance were to fall upon these outsiders, they would probably act similarly, if not worse off. So what is the moral of all of this. Each one of us is taking risks all the time, sometimes we lose, sometimes we gain, but it is the collective understanding that might just make the difference.